Malalai Joya has a simple message for US, NATO, and Afghan leaders: Get out. 'Get out' of her country, she tells those from the US and other western nations. And to the warlords, the Taliban, and the fundamentalists represented in the ruling government, she says 'get out of the way' of a peaceful and prosperous future for regular Afghans. As Afghan President Hamid Karzai prepares to meet with Barack Obama on Friday and speculation swirls about the future US role as 2014 slowly approaches, one of Afghanistan's leading peace advocates has a message that those in the US—increasingly cited for their war-weariness—rarely hear: Afghans themselves, caught between an occupying power and a corrupt government, are "fed up" with war, death and the destruction of their rights and aspirations. "We are fed up with the so-called 'helping hand' of the US and NATO that is used to justify occupation," Joya said in an extensive interview with journalist Elsa Rassbach and published by Common Dreams Thursday. 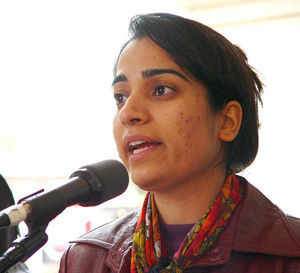 Joya, who rose to international prominence as the youngest female member of the Afghan parliament in 2005, says the US-led war in Afghanistan—"waged under a fake banner of human rights and democracy"—has gone on far too long, and what most Afghans want is the complete withdrawal of US troops so that regular Afghans can reclaim their dignity and solve their own problems. Responding to the Obama and Karzai meeting, Joya explained to Rassbach that agreements made in Washington between the two will do nothing to improve the lives of most Afghans. "Karzai and Obama are working on an outline of an agreement for legalizing permanent military bases in Afghanistan," she said. "But as long as we have foreign military bases in our country, we have no independence. And when we have no independence, we have nothing, and all talk of democracy, human rights and women's rights is a joke." As far as the US government is concerned, Joya added, the "wellbeing of the Afghan people has no value at all." "The U.S. elites just want relative stability in order to continue the occupation and maintain military bases in Afghanistan without much trouble. If 'stability' can be achieved by empowering the worst enemies of Afghan people, they are ready to do this. After all, the U.S. schemes to interfere with and control Afghanistan did not begin with 9/11. They go back for decades." "There is already a civil war, a dangerous civil war. Whether the foreign troops stay or leave, war is going on. The presence of foreign troops only makes our struggle for justice harder, because the occupiers empower reactionary warlords -- and now also empower Taliban." As many experts contend, it is the occupation itself that helps fuels and supports an otherwise beleaguered Taliban force. "If the troops honestly leave, the backbone of these terrorists will break," Joya said. "We are fed up with the so-called helping hand of the U.S. and NATO that is used to justify occupation. The mother and father of all these tragedies is the occupation itself and the U.S./NATO support of the killers of my people. When the occupation leaves, these fundamentalists will get weak. They have no roots in the heart of the people, and their backbone will break. If the U.S. stops helping terrorists and killers, then they may not be in a position to wage a civil war and destroy Afghanistan like they did in 90’s." Asked about the often cited issue of protecting women's rights, Joya once again pushed back against the familiar narrative that the US occupation, if nothing else, has been a positive development for women's freedoms. "The situation of women in Afghanistan was used as an excuse for the U.S. and NATO to occupy our country. But it is clear they were not fighting on behalf of women, because they have put into power the reactionary warlords who are sworn enemies of women," she says. Regarding members of the ruling government—whom Joya often simply refers to as 'warlords'—she says, these men "are misogynists, just like the Taliban, and they don't want women's rights in Afghanistan; a few token fundamentalist ladies wearing beautiful clothes should not fool people." The Afghan people are fed up. Fundamentalism and occupation are no longer accepted among the common people because of the brutalities and savagery they have experienced over the past decade. There is more openness, now, to progressive and democratic organizations and ideas. With the passage of time, I hope for the emergence of a powerful justice-loving alternative in Afghanistan. The U.S. is the main obstacle towards the development of such democratic forces. Some people are deceived by the anti-imperialist banner of the Taliban, and education is in fact the key to get rid of all of these miseries, all of this ignorance. I remember someone called me when I was in Kabul and said, "Oh my sister, I am in the mountains. I support you. I agree with you. You are against occupation. You are against these warlords. I went to the Taliban to take my revenge against the warlords" -- and he told me a long story on the telephone. I said, "Please come down from the mountains. Don't go with the Taliban. Going with one terrorist to take revenge on another terrorist makes no sense. They are deceiving you." He said, "Yes, I agree with you, but there is no way for me." And I discussed with him. This is part of the important role of democratic-minded activists. When women learn to read and write, many of them become extraordinary activists, and these brave women are running projects and organizations that are really working on behalf of women's and human rights, like RAWA, like OPAWC, like the Social Association of Afghan Justice Seekers, and a few others that I know who are also justice-seekers. And now women are even coming onto the streets and demonstrating, wearing the burka, in resistance against the U.S. and NATO and also against the Islamic fundamentalists. This is a positive example and a source of hope. In the history of Afghanistan, we have never before seen this kind of activism by women. In different parts of Afghanistan there are small protests -- in Kabul, in Jalalabad, in Helmand Province and in Farah Province, and in many other places -- and for the first time women are joining these protests. I hope that with time, there will be a broader movement in Afghanistan like in many of the Arab countries. It will take time. As the great German writer Bertolt Brecht said, "Those who struggle may fail. Those who do not struggle have already failed." Stop this criminal war in my country as soon as possible. Your war, waged under a fake banner of human rights and democracy, is in fact a war against poor Afghan people. You are not only traitors to the Afghan people, but to your own people as well. You are stealing from the pockets of poor Americans and Europeans and wasting billions of dollars on killing and looting in order to safeguard only the interests of a very small, elite minority. You have a massive war and propaganda machine to sell your lies. But the world's conscience, which includes a large number of U.S. antiwar veterans, is against you: you can’t overturn it by any means. So your war machinery is doomed to fail, and the toiling people of the world will win. Read Elsa Rassbach's complete interview with Malalai Joya here. Grenades and shells left on the firing ranges where troops practiced with their weapons, and munitions fired at or from the bases that didnt initially explode, have killed more than 50 civilians in nine provinces since 2008, nearly all of them in 2012 and this year.